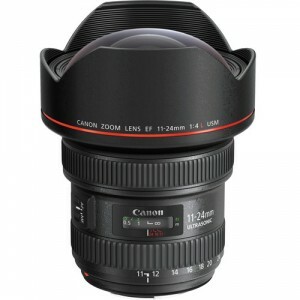 The Canon EF 11-24mm f/4L USM is the widest rectilinear lens for full-frame DSLR Canon cameras. The lens sports the “L” designation which means it is targeted specifically at professional photographers. The lens is ideal for Landscape and architectural photography and takes in vast sweeping vistas and full interiors. It also features a constant f/4 aperture to help in lower light when depth of field is not a priority, although the 16-35mm f/2.8 lenses are a better choice in low light. The Canon EF 11-24mm f/4L USM lens can also be mounted on APS-C bodies such as the Canon Rebel series. When mounted on these cameras it will yield and effective field of view similar to an 18-38mm lens on a full frame camera. I have not formally reviewed the lens yet, but plan to in the future. The initial reviews for the Canon EF 11-24mm f/4L USM are quite positive. Although the lens is very expensive, it offers excellent image quality and is built like a tank. based on 143 user reviews online.